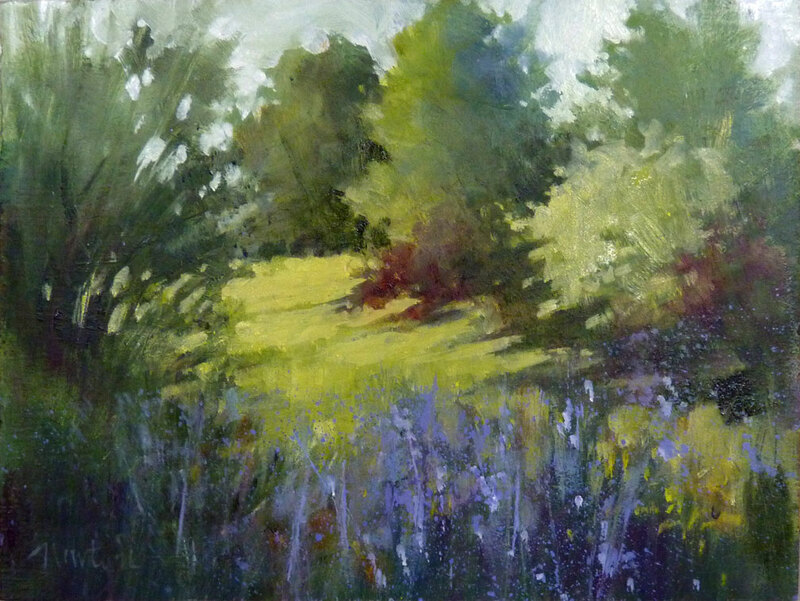 It's the first of a new month and time for another Studio Sale posting. This month, "Bejeweled" is looking for a new home. 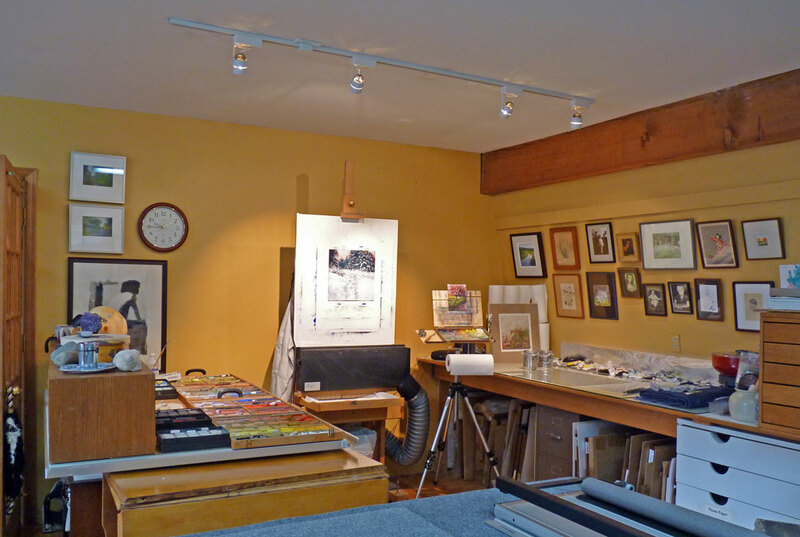 Select the Studio Sales link in the sidebar to the right or, click on the title of the drawing. A workshop with me? Though I retired myself from teaching workshops I continue to receive emails asking if I teach. For a few years I just said no and that felt right but now I'm considering a workshop or two during the summer months. I haven't kept the names from all the emails requests so I am posting this notice. Whew, I've been thinking about that decision too long - thanks for your input. I love to move furniture around in our house...everything old seems new again. However, with the purchase of a 5-ton sleeper sofa, installation of hanging lights over the dining table and the addition last summer of a super heavy Sleep Number bed, the furniture I can move is dwindling and I don't like that. I long to recreate and renew living/working spaces. 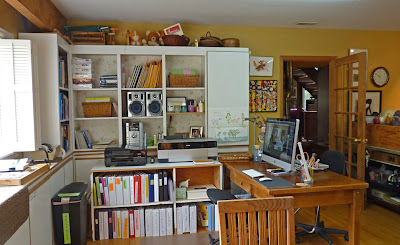 On this blog, you've seen my studio painted and repainted, arranged and rearranged. Through it all, my office area has stayed in the same corner for more than 20 years. That is, until last week. One of the galleries that represents me asked for larger oils and I couldn't imagine how I would paint larger in my current studio set up. So, I began to ponder switching my office corner with my painting corner. Once I measured, and was willing to give up my old Boeing Surplus metal desk because it just wouldn't fit, I got excited to make the change. 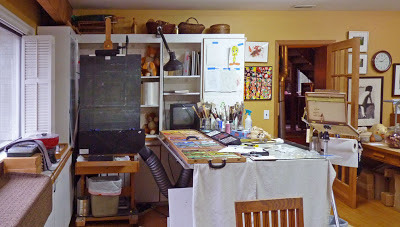 Just one problem, as bad as the lighting was on my easel, in its current location, it would be even worse in the opposite corner. My husband to the rescue! He offered to replace the overhead fluorescent light with track lighting. Hooray! I won't go into the details of what a big mess it made to make the switch or what three days of lifting, shoving, sorting and organizing felt like, I'll just show you the before and after photos. 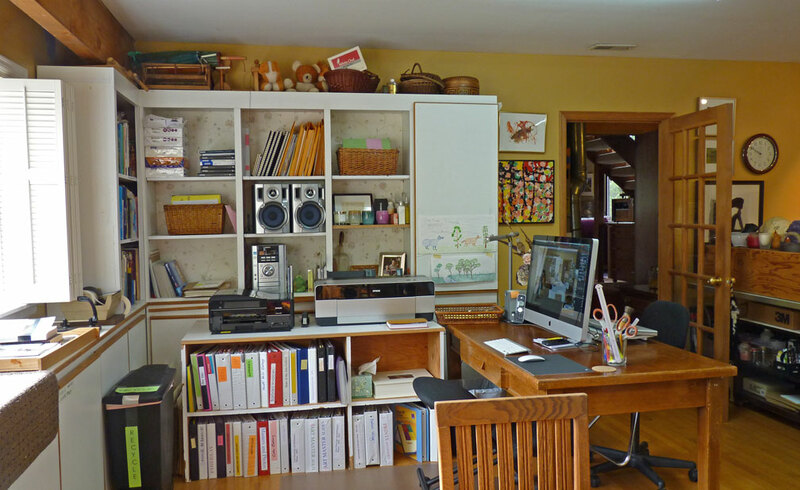 The two photos above are the Southeast corner of the studio (before it was my studio, it was a double car garage). 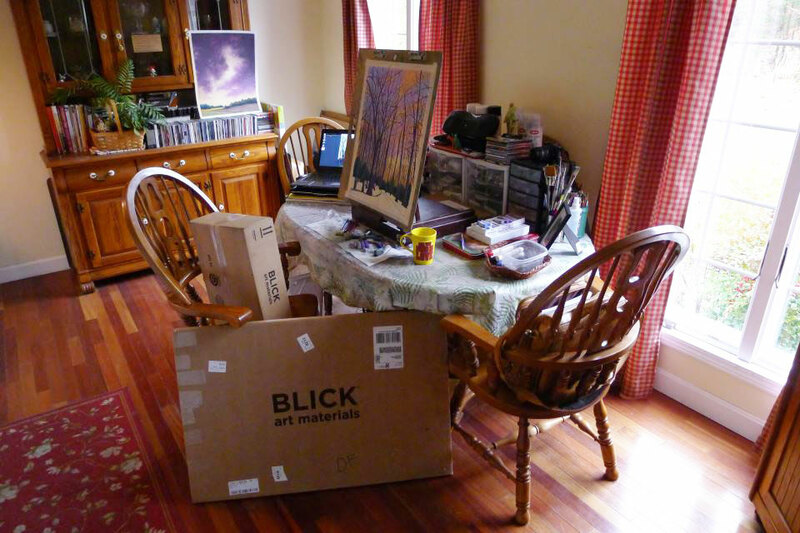 The top photo is the painting area as it used to be: one side of my Boeing Surplus drafting table held pastels for the easel tucked back in the corner and the other side of the table is covered with glass for oil painting. My Open Box M on a tripod was at end and very convenient to trip over. 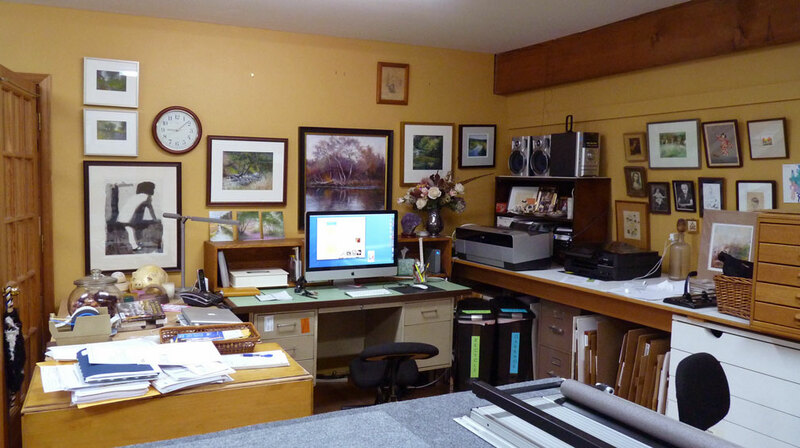 The other photo shows the same area but now it is my office. 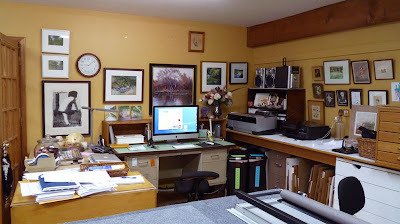 The two photos above show the Southwest corner, first as the long-time office and now as my new painting area with pastels on the drafting table to the left of the easel and the glass area for oil painting on the right. And, because of the track lighting, I can actually SEE. I look forward to painting! I finally opened a shop on Etsy! 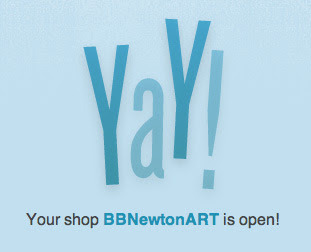 To search for it on the Etsy site, type in BBNewtonART. 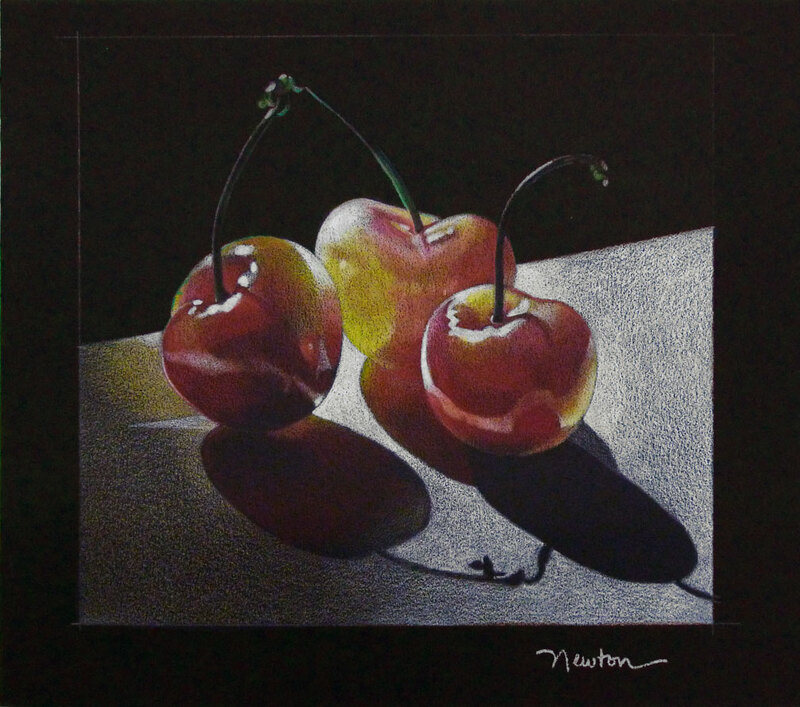 I have posted a half-dozen still lifes but will add landscapes in the future and perhaps some prints. 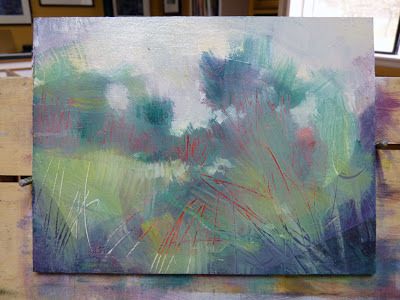 Also, I still plan to make a painting or two available each month on my Studio Sales blog (see the link in the sidebar here). 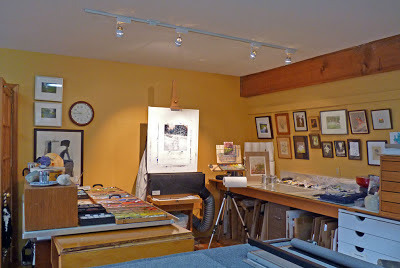 Big changes going on in my studio, I hope to post photos about it soon. 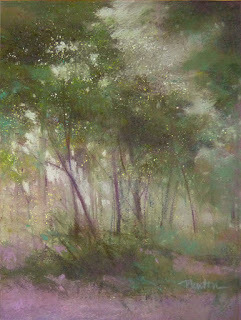 I found a forgotten pastel painting done on magenta Canson Mi-Teintes, soft side (less textured side). There were parts of this painting I loved so I cut two 8x6 inch sections out, each to stand alone as a separate painting. They will be posted together on my Daily Paintworks Gallery. Calling it done. "Bosc on Blue," pastel on Wallis paper with an oil underpainting, 13x 13 inches. To see the beginning steps of this painting, see my Feb. 15th post. 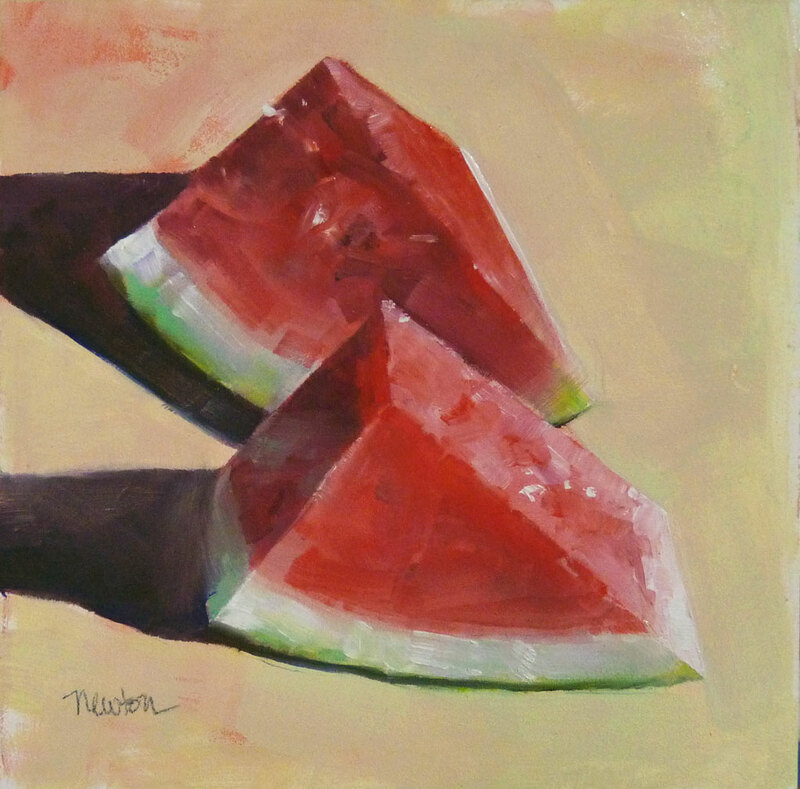 The oil color study for this painting, is posted on my DPW gallery. "Garden Pond," pastel, 10.5 x 10.5 inches. 1. I came across a piece of 12x18 inch Belgium Mist Wallis in my flat file that I had used for an exercise in a workshop a couple years ago. After brushing off the horizontal scene, I turned the paper sideways so I wouldn't be distracted by the ghost image of the previous painting. Using a pastel pencil, I indicated an area 11x11 inches and blocked in the lightest areas of a new painting with an oil wash.
3. 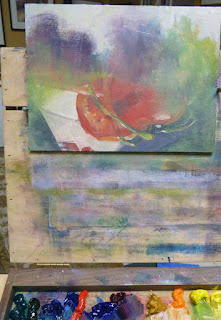 After the oil was dry (a couple hours), I began to apply pastel in the darkest and lightest areas of the new painting. 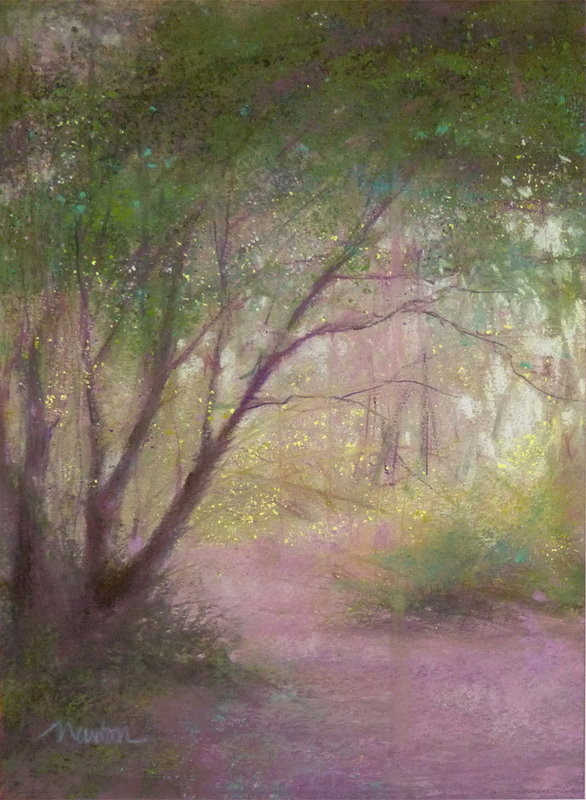 The pastel on this one took less than 2 hours. Less is more. Don't dawdle and doodle because your marks become picky and labored. I've been looking at this painting for 10 days thinking it was about 75% done but when I put it back on the easel today, I just punched up the lights and called it quits. You can see the progression paintings on my Feb. 6th post. 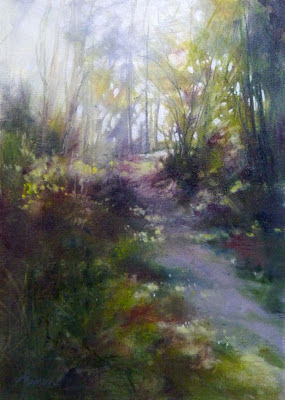 "Morning Mist," 14 x 10 inches, oil on canvas paper mounted on gatorboard. 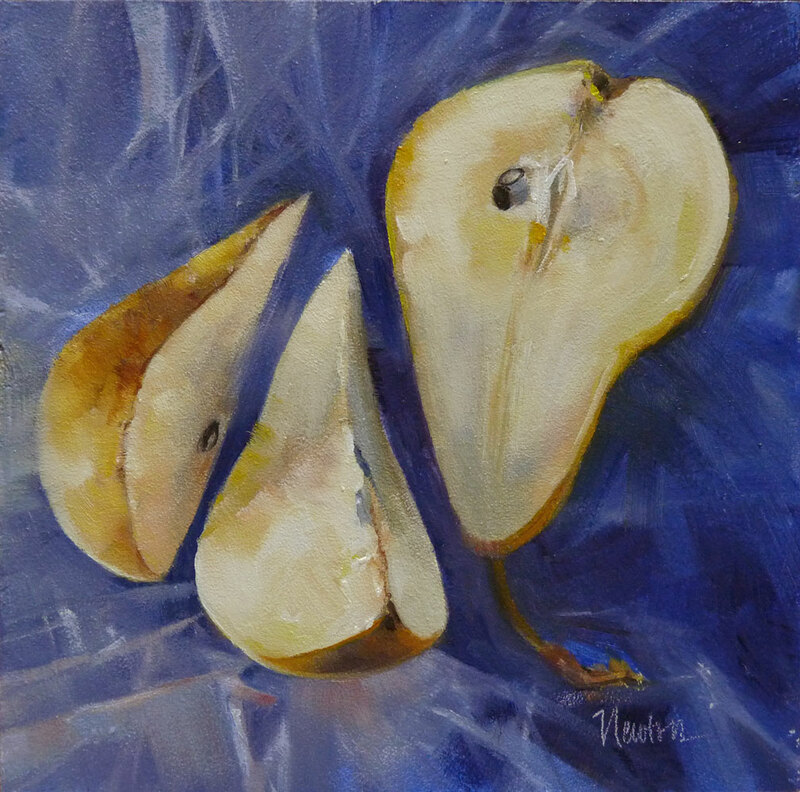 I haven't really explored fruit in pastel so during these few weeks of play I'm trying a pear on Wallis paper. 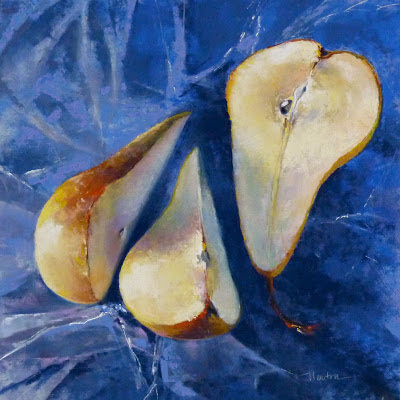 To prepare, I painted a color study in oil (shown above), "Bosc Color Study," oil on panel, 7.75 x 7.875 inches. 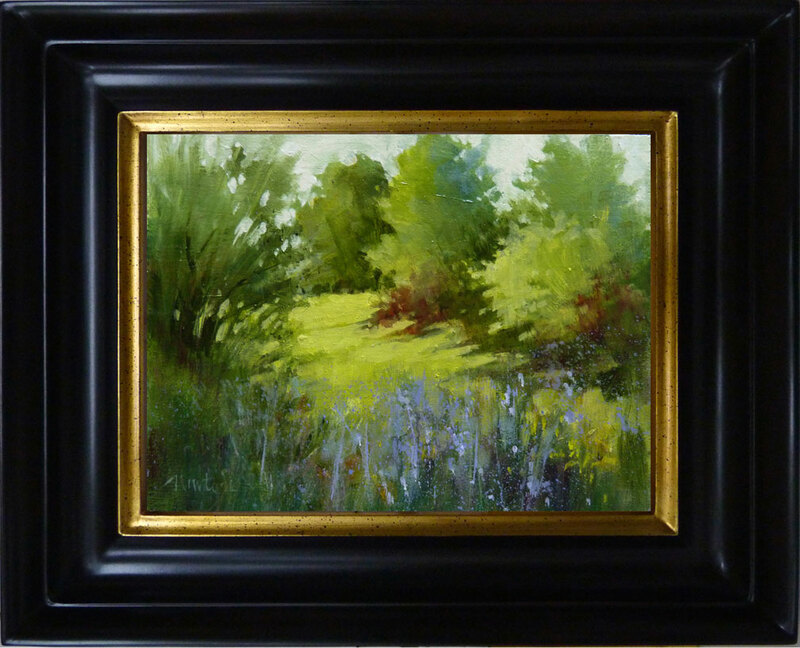 Watch for this painting on the Daily Paintworks auction. Below is the progress of my pastel painting that is about twice the size of the color study - 13 x 13 inches. 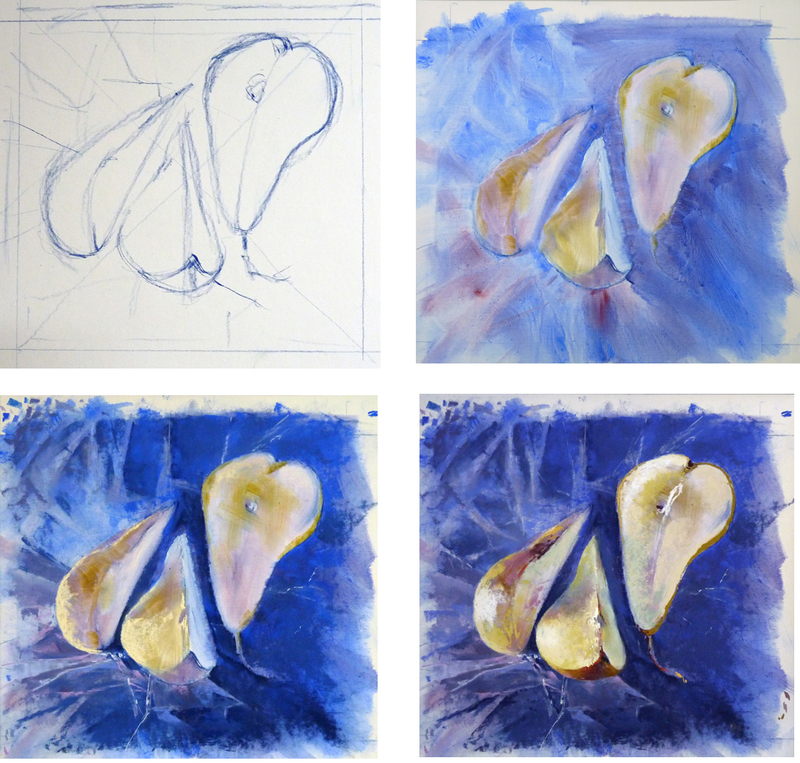 First, a line drawing was done with blue pastel pencil, then an oil-wash under painting. 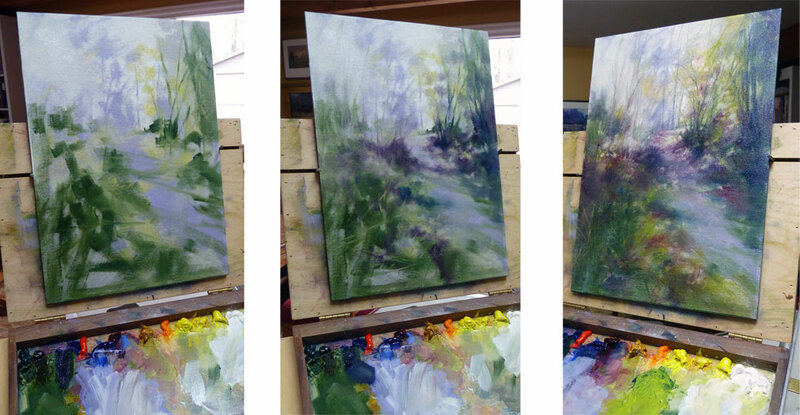 The two bottom photos show the beginning of adding pastel (left) and at about 70% complete. The surface the pear is sitting on is plastic wrap (wrinkly) protecting a sheet of blue Canson Mi-Teintes paper from pear juice. The color on these shots isn't perfect but I'll post the finished piece when I'm done. 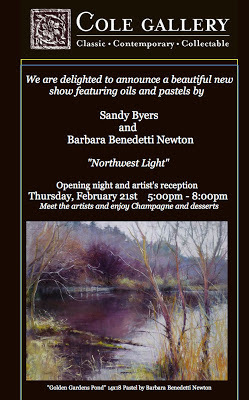 I hope you can join us Opening Night, Thursday, February 21st, 5-8 pm. 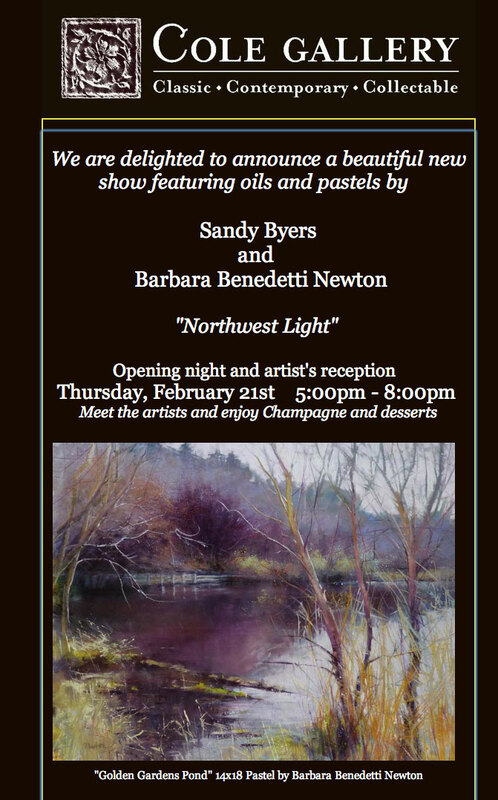 You can also see the entire show online at Cole Gallery. This is the formal/framed shot of my latest 6x8 inch oil on hardboard, "Washington Park Spring •." 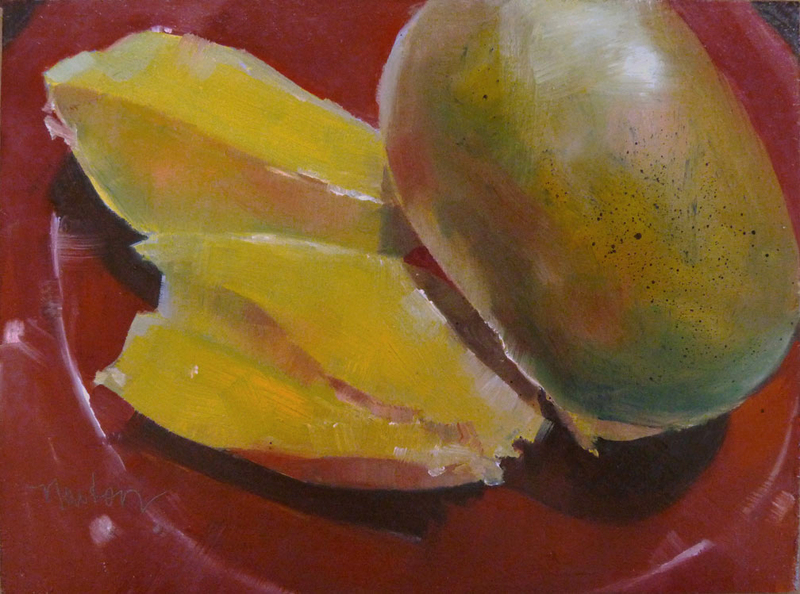 I painted this mango some time ago and I want to paint a mango again. Such beautiful colors that change daily as it ripens. This painting is oil, 6x8 inches on hardboard panel. You can view it with the magnifier on Daily Paintworks. A couple things...first, I'm done playing with those tomatoes. I've posted the finished painting as the conclusion to my Feb. 5th post. And secondly, I'm trying something new: I bought a pad of Fredrix canvas paper and used YES glue to mount one sheet on Gatorboard. I don't like the springy feeling of a stretched canvas so this solves that problem. I'm working (playing) with a path near the Cedar River. Here's a photo of how it is coming along. I'm doing a lot of lifting color back off the ground - a technique I also used with colored pencil and reusable adhesive. With oil, it is a brush wet with mineral spirits in one hand and a Viva towel in the other. Lift, wipe the brush, repeat. Every few months I come across this little painting tucked away in a drawer or on a shelf in my studio. It cheers me each time I see it but I will probably never get around to framing it and hanging it somewhere here so I posted it on Daily Paintworks to cheer someone else's winter months. This is my previous post continued. 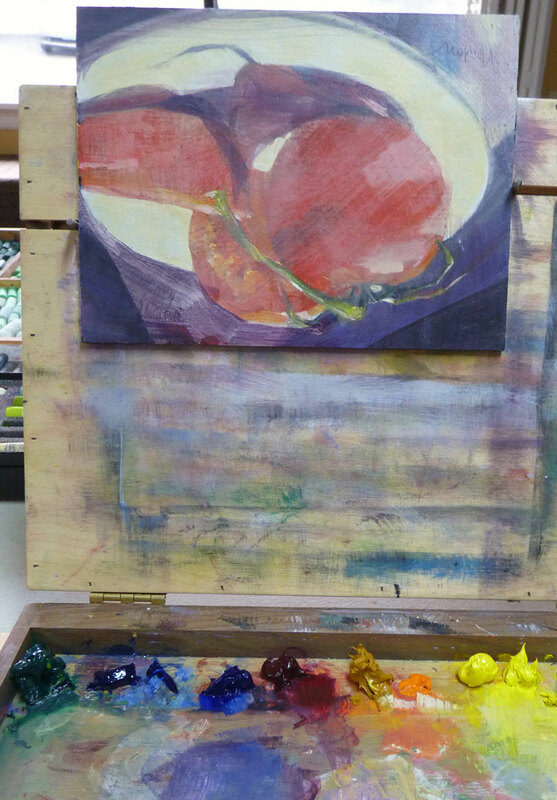 I had to wipe off the foreground, all the way back to the original tomato. When I say 'had to' I mean the painting direction wasn't working. Apply paint, push it around, try to get a vision for the painting....nothing! So, I just wiped the bottom half off and began again. Well, every hint of tomato is gone. Obliterated by lots of green oil paint in this scene reminiscent of another part of the Washington Park Arboretum, this time in spring. I wanted to utilize the red of the tomato under painting but when I didn't insist, this little painting evolved on it's own. That's OK with me, especially during these weeks of playing. 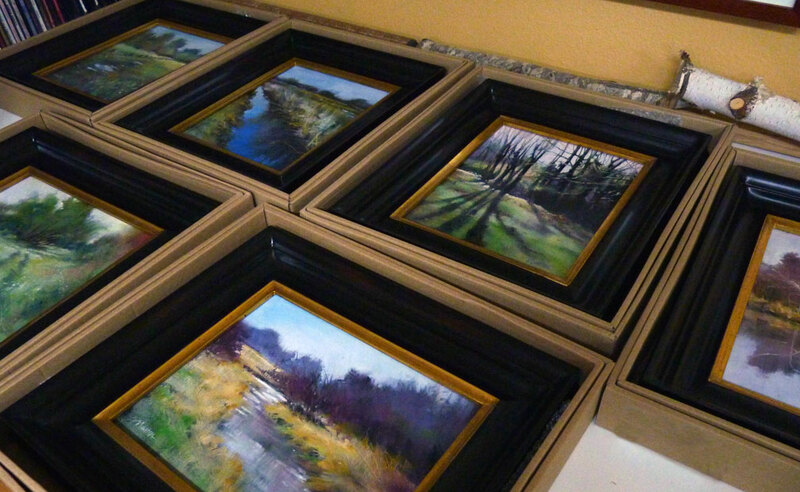 For several months, I've been painting for upcoming shows at Cole Gallery (WA) and Attic Gallery (OR). Now it's time to play - loosen up, experiment, take myself and my work less seriously. The next best thing to creating a painting you are pleased with is obliterating a painting that isn't working. Digging around my studio, I found a painting of tomatoes that was pretty bad so I white-washed it a little, turned it upside down and began again. 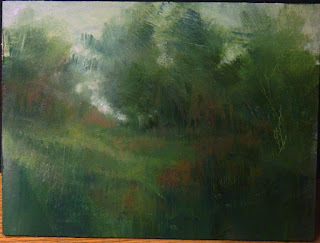 After adding masses for a landscape, I used my gloved fingernail to scrape some grasses into the foreground so the tomato-red peeks through. Not sure where this will go...I'll keep you posted. Today I'd like to pay homage to perseverance. I admire this attribute and I am grateful for those who are shining examples for me. I'm impressed by the perseverance and bravery of those who find themselves in challenging health situations. A well known pastelist whose work I follow online is sharing her current health journey with the art community. She is an inspiration to me. I'm impressed by those who persevere to paint no matter the weather conditions. While I'm deciding whether or not I to walk the dog in the rain, Haidee-Jo Summers is out painting every day in the cold and snow. 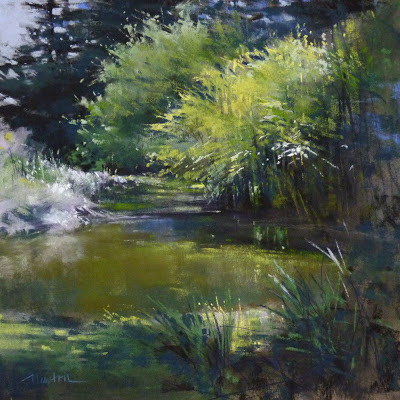 She inspires me to paint more plein air this year. And, I am in awe of the many artists who paint everyday in whatever limited space they have. One such person is a fb friend, Gary Edward Jennings. I asked his permission to show you his table-top studio. Here's wishing you (and me) the ability to carry on, to keep at it, to hang in there and to persevere. On another note, (or maybe it's the same subject?) I have posted two new paintings on my Studio Sales blog. These are paintings from my studio flat files, directly from my studio to you. Thanks for taking a look!